SUAS Archives - Explotrain, LLC. Explotrain’s Explodrone was featured in UAS Weekly’s publication, highlighting the importance of training now, rather than waiting to address the threat once it becomes more prevalent. Explotrain® LLC, a Florida based small business, is taking the defensive response to the emerging drone threat straight to the troops through their development of a realistic drone based IED simulation and training system. With the first and only functional drone and simulated IED integrated device, Explotrain is addressing the vital and emerging threat of drone weapons in theater. Asymmetric warfare by its very nature leads combatants on all sides to develop new weapons and defenses. The latest emerging threat in current conflicts is the use of sUAVs or drones as a method, not of reconnaissance, but delivering and deploying weapons in the form of explosives. The drone based IED delivery systems seen most recently in Syria, Iraq, and Afghanistan are just the latest step in the evolution of the improvised explosives threat. While the US military is exploring multiple counter drone technologies, from electronic signal jamming and interception to laser based disabling systems, Explotrain has created the first and only drone based IED simulation system to be used in live training, testing and evaluation. As the recognized leader in products currently used for training against the conventional IED threat, Explotrain is using their patented technologies to accurately simulate IEDs delivered by drones and other Small Unmanned Aerial Systems (sUAVs). Working in conjunction with military, law enforcement and business partners, Explotrain’s new ExploDrone™ system is able to accurately simulate the two main types of attacks carried out by enemy drones. Lightweight pneumatic based Explosive Blast Simulators are carried by larger drones and are used to simulate attacks wherein the drone itself is used as an explosive device, akin to the Japanese kamikaze pilots of WWII. However, unlike their real world counterpart, these training drones and simulators can be reused indefinitely to save training costs. Additionally, smaller drones are used that carry simulations of the repurposed military and improvised munitions that are being dropped onto personnel, vehicles, or other military targets. These simulated munitions are interfaced with Explosive Blast Simulators pre-positioned in or on the target area to create the realistic effects so necessary to providing psychologically effective training to ground troops. One of Explotrain’s partner companies, Inert Products, specializes in the rapid development and reproduction of ordnance and munitions and is capable of providing the wide array of Inert Dropped Aerial Munitions (IDAM™s) that troops and law enforcement are likely to face. By using these and other advancements in rapid manufacturing technologies, Explotrain and its partners are able to reduce costs while providing the rapid response to emerging threats now needed. These advancements are used not only in training scenarios but also as a means of testing and evaluating new tactics and technologies without the risks and expenses of using them against a live threat. Find more information on the ExploDrone HERE. Fort Walton Beach, FL: While military, law enforcement, and security professionals are working diligently on defensive technologies to counteract the emerging threat of Small Unmanned Aerial Vehicles (SUAVs), one small business in Florida has adapted their existing technologies to create the first simulation system to provide effective training products. Explotrain has led the Battlefield Effects and IED/EOD Simulation and training industries for several years. Now, they have turned their attention skyward and created a realistic and effective simulation system to replicate this rapidly developing threat. Explotrain’s president, C. Dean Preston said, “Since 1998, Explotrain has provided our military and law enforcement personnel with realistic training and simulation products versatile enough to allow them to reproduce the enemy’s threats and tactics as they emerge. That versatility and realism are now allowing us to replicate the emerging threat of SUAVs, or drones as they’re more commonly known. The rapidly evolving tactics and technologies of the enemy require a training system that can respond rapidly so that our troops are able to train against the new threats they will be facing today”. Since the development of their training system and Model X-01™ Explosive Blast Simulator in 1999, Explotrain has invented and produced much of the technology used to train troops in the areas of Explosive Ordnance Disposal and IED Defeat on both land and sea. 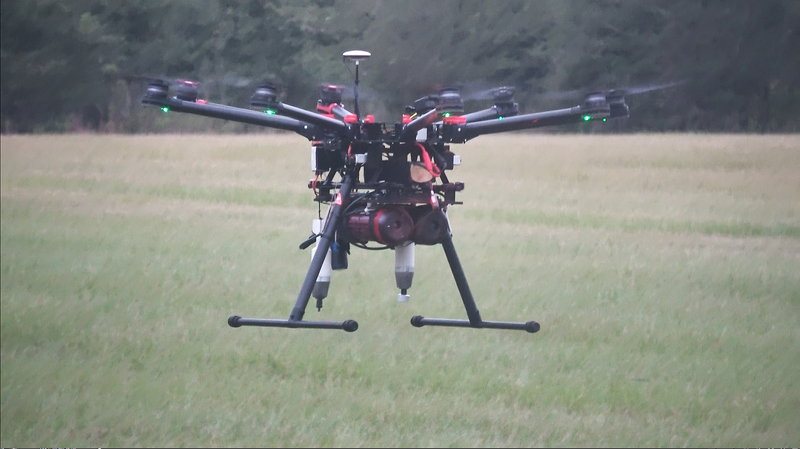 The new Explodrone™ system now will allow training with simulated threats from the air as well. The Explodrone System will be available for purchase in the fall through various government contracts or by contacting Explotrain directly.